FORT WORTH, Tex. – The suddenness of the accident took Kyle Busch by surprise. And an hour later, with work complete on a backup car, the No. 18 Joe Gibbs Racing team was still feeling the aftershock. Busch hadn’t completed a lap in opening NASCAR Sprint Cup Series practice when his Toyota chattered over the bumps in Turn 3 at Texas Motor Speedway and smacked the outside wall. “We got into Turn 3, and the car felt great, loaded up really good,” Busch said. “Got back to the throttle, and then got to the bumps that are over there in (Turns) 3 and 4 and felt like it bottomed out a little bit and kind of got me up the track. And then from there, the whole car just kind of came out of the track and I got loose and couldn’t get it checked up or slowed down before it slapped the wall. Busch had time for only four laps with the backup car before practice ended, and he posted the 22nd fastest speed at 193.002 mph. 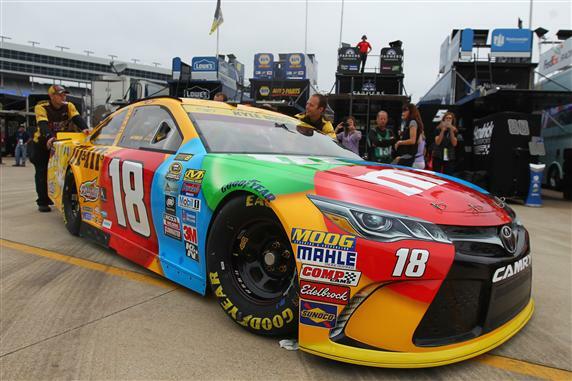 With ample time to practice the car on Saturday, however, Busch doesn’t feel that using a backup will have a major effect on his chances in Sunday’s AAA Texas 500 (2 p.m. ET on NBC). “As far as going to backup cars, in years past I haven’t had that situation happen to me ever–I don’t think I have ever crashed on the first lap of getting out there on the race track before,” Busch said. Busch currently is fourth in the Chase for the NASCAR Sprint Cup standings, four points ahead of Joey Logano in fifth. After the Nov. 13 race at Phoenix, the Chase field will be cut from eight to four drivers.